Student-athletes from Immaculate High School signed with colleges to run cross country/track & field or play college football, baseball, basketball, golf or lacrosse at a special signing ceremony recently. Brookfield resident Matt Villanueva will run cross country and track for St. Bonaventure University. Abigail Allen of New Miford will golf, Emma Connolly of Danbury, Sean Connolly of Danbury, Patrick Cropsey of Ridgefield, Connor McNerney of Sandy Hook, Ayanna Simmons of Danbury, Dominique Valentine of Danbury and Matt Villanueva of Brookfield all committed to their college’s track & field/cross country teams while Ronan Doherty of Danbury will shoot hoops, Isaiah “Jake” Payton of Danbury will fight for the pigskin, Andrew Chiodi of Ridgefield and Jimmy Fahey of Danbury will run the baseball diamonds and Adriana Chamberlin of Bethel and Brianna McDonough of New Fairfield will shoot for the goal on their college lacrosse teams. Abigail Allen will golf on the girls team at the University of Scranton, where she will major in Secondary Education and History. A member of the IHS volleyball and girl golf teams, she was part of the effort that won the golf Patriot Division Championships in 2016. Also an artist, Abigail is president of the IHS Art Club and earned the Connecticut Association of Schools Excellence in Art Award and school recognition for Excellence in Art, Excellence in Scenery as well as Excellence in Campus Ministry. Adriana Chamberlin signed to play lacrosse at St. Lawrence University while majoring in Biology. Adriana played midfield for the IHS girls soccer team and midfield/attack for the girls lacrosse team, and was a captain for both teams. Named to the All Patriot Division in lacrosse her junior year, Adriana was a member of the soccer team that won two State Championships and a SWC Championship. A member of the IHS National Honor Society consistently making High Honors as well as the Mock Trial and Key Clubs, Adriana also received the Silver Key Scholastic Art Award from the Connecticut Art Education Association and the Presidential Service Award for community service. Emma Connolly will participate in track & field while she majors in Exercise Science at Sacred Heart University. She ran indoor and outdoor track all four years at IHS, as well as cross country her senior year. Emma received SWC All Conference Honorable Mention, All Conference First Team (twice) and All New England for the 4x800 honors for indoor track; All Conference first team (twice), All State First Team for outdoor track, and All Conference second team for Cross Country status. She is a member of the IHS National Honor Society, receiving Distinguished Honors, and a member of the She’s the First and Key Clubs. Sean Connolly signed to run track & field at the University of Scranton, where he will major in Entrepreneurship. Sean, a long distance runner, ran cross country, indoor track and outdoor track & field at Immaculate. He was a captain for the IHS cross country team and received SWC-Honorable Mention status and was part of the IHS team that came in second in the Class ‘SS’ State championships. For indoor track Sean received SWC Honorable Mention status and was Class ‘S’ 4x800 runner-up and part of the team that won the Class ‘S’ State Championship. He broke the outdoor track 4x800 school record, and was a State Open qualifier. Sean, a Distinguished Honors student, is a member of the IHS National Honor Society and Key Club. Andrew Chiodi will play baseball for Western New England University in Springfield, MA as he majors in Business. As a varsity pitcher for IHS, Andrew was on the team that made it to the 2017 State Tournament and was named a “Player to Watch” by the Danbury News Times. He is on the IHS honor roll and a member of the athletic game cheer section the Mustang Stable. Patrick Cropsey signed to run cross country and track for Loyola University Maryland, where he will major in Finance. A four-year cross country runner for Immaculate, he also ran indoor track his upperclassmen years after playing basketball, and ran outdoor track for three years. Patrick was Rookie of the Year, MVP, Most Improved and team captain in Cross Country. He was part of the 2017 team that won the Southwest Conference and Class S State Championships. A member of the National Honor Society, Patrick also participated in the IHS Mock Trial and Key Clubs. Ronan Doherty will play basketball at SUNY Maritime, where he will major in Mechanical Engineering. He was a varsity basketball starter all four years at Immaculate, and helped his team win the Division II State Championships in 2016 & 2018. Ronan also was a rare 1,000 point scorer. He is a member of the IHS National Honor Society. Jimmy Fahey signed to play baseball at Trinity College next Fall, where he will major in Engineering. While at Immaculate, Jimmy played baseball and football all four years and basketball for two years. He was the captain of his baseball team junior and senior year, and received 2016 Southwest Conference Honorable Mention and 2018 All Patriot Team status for the sport. Jimmy was also captain of the co-op Abbott Tech-Immaculate (ATI) football team and earned the National Football Foundation’s Scholar Athlete Award. He was part of the basketball team that won the 2016 Class S State Championship. Jimmy also is a member of the IHS National Honor Society and a Student Ambassador. Brianna McDonough will play women’s lacrosse at Hendrix College while majoring in Pre-Med with a Psychology concentration. She played field hockey and lacrosse at Immaculate, serving as LAX captain. An honor roll student, Brianna was also a Student Ambassador and a member of the Culinary Club. Connor McNerney will run Division I cross country and track at the College of the Holy Cross, where he will major in Political Science/Pre-Law. While at IHS, Connor received All SWC Runner (twice) and All State Runner - cross country (twice) honors, came in first place at the Stratton Brook Invitational and set school records for indoor track for the two mile and the 4x800 and for the 5K, steeplechase and 4x1 mile for outdoor track. Connor is also captain of the cross country and track teams, President of the National Honor Society, a Student Ambassador, Events Coordinator for the Student Council and a member of the Mock Trial and Model UN teams. Jake Payton signed to play football at Western Connecticut University while he majors in Computer Science/Cyber Security. At Immaculate he played running back, wide receiver and safety positions for the ATI football team, and was a guard for the basketball team. A senior captain of the football team, he earned All League status junior and senior year. He received All League Second Team honor his junior and senior year for basketball, and was part of both teams that won the Division II State Basketball Championships (‘16 & ‘18). A Student Ambassador and member of the Video & Photography Club, Jake also helps run the summer Mustang Basketball Camp. Ayanna Simmons will attend Southern Connecticut State University, where she will be throwing shot-put and discuss for the Division II track and field team and studying Athletic Training. Ayanna was a founding member of the IHS girls swim team, and started with shot-put and discuss in her junior year. She is also involved with the school’s Key Club, Brain Trust, Spring Musicals and various charitable events in school and in her community. Dominique Valentine will be a member of Fordham University’s track & field team. She will major in General Science with a pre-veternarian focus. At IHS, Dominique played varsity soccer and ran for the varsity track and field team. Her indoor track and field honors include: All Conference Honorable mention (2016), All Conference First Team (‘17 & ‘18), and All New England (4x800, 2018), and her outdoor track and field honors include All Conference First Team (2016, 2017) and All State First Team (2017). She was varsity co-captain senior year for both teams, and was a member of the girls soccer team (forward) that was the SWC champs in 2017 and State champs in 2014 and 2016, and also a member of the State runner-up winning teams for indoor track in 2017 and 2018 and outdoor track in 2017. Dominique was also a member of the National Honor Society and earned High Honors, the Rebecca Draper-Townsend Angel Award and the She’s the First Outstanding Achievement in Fundraising award. Matt Villanueva will run cross country and track for St. Bonaventure University-NY and major in Secondary Education and English. He ran year round for Immaculate, and his cross country, indoor track and outdoor track accomplishments are impressive: individual honors for the 2017/2018 year include conference qualifier for indoor track, medals for cross country for the Stratton Brook and Nonnowag Invitationals, SWC All-Conference Honorable mention, and team captain. Matt was part of the IHS cross country teams that won the Stratton Brook and Nonnowag Invitational Championships and were Class SS runners-up, and of the 2017 indoor track team that were both SWC Conference Champions and Class S State Champions. He was also in the cast of three IHS musicals and a member of the Mass Band, received the Presidential Award for Community Service and is an honor student in the National Honor Society. “We are very happy for these students, and also very proud. 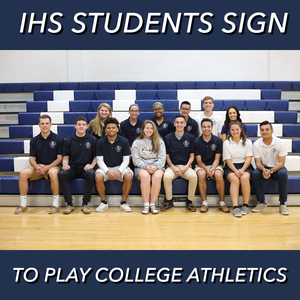 As you can see they are so talented and have been so dedicated to their sport(s) that they have been chosen to continue playing for some great colleges,” said Tim Dunn, IHS Athletic Director. “Not only did they excel at athletics, these students were committed to serving the community and their school and had many other talents that they shared with Immaculate High School, all while achieving academic excellence,” he added.